The Spring Carnival is over again, and it was a very tough one for many punters. Thankfully though, not for followers of Trev and his Melbourne Ratings package. 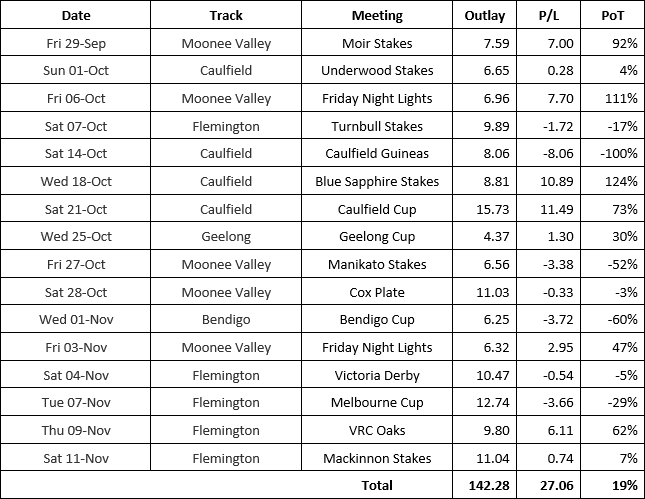 In this busiest time of the year, Trev covered 14 metro meetings plus the Geelong and Bendigo Cups in the space of 40-odd days. The headline numbers are 142 units outlaid, for a profit of 27 units at a PoT of 19%. So $2,700 profit for those betting just $100 per unit. In a carnival where many struggled, they’re hugely impressive numbers and just another example of how successful Trev’s approach is. A quiet but very successful night, only betting into three races. A great start with Muraaqeb, which we rated at $6.5 and backed at $10 for a big result. We bet around I Am A Star in the Stock Stakes, which saluted, but closed the night with another big winner in the last – we rated Showtime at $2.9, and backed it at $4 for the win. We copped a couple of questionable rides here and a bit of bad luck. For our part we also missed some better odds, which all in all added up to what was virtually a break even day. The highlight was backing Perast at $11 after rating it at $8 – our only bet in the Guineas Prelude for a good collect. And it would’ve been better if we’d taken the better odds earlier. Hartnell running second in the Underwood robbed us of a better day. The good times kept rolling under lights at the Valley. Great results with Kawabata (rated $8, backed at $13) and Gwenneth (rated $6.5, backed at $8.5) both winning to make for a tidy profit for the night. A bit of a frustrating day, but no major damage done. Good winner with Now Or Later (rated $10, back at $13), and we chopped out in the last by saving om Pure Pride. Shorties Almandin and Leather’n’lace both got rolled and cost us a winning night. …and we get it back, and then some. Good lesson regarding the punt; don’t let a single poor day get you down. Quilate was the key to the day – rated it at $17. 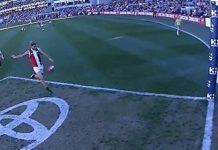 We bet early at Bet365 and actually took $34, but with the SP Guarantee it paid $41. Another lesson: if you’re betting early, this makes Bet365 the best option. Rich Charm was a good winner too, rated it $3.60 and backed it at $5.50. Another great day at Caulfield. Winners with Our Crown Mistress (rated $2, backed $2.5), Pinot (rated $3.7, backed $5.5), Kiwia (rated $4.8, backed $7) and Snitty Kitty (rated $3.20, backed $4). Cup itself was a bit disappointing, missed the winner as did everybody else. Good winning day overall. Had a quiet day down at Geelong, only betting into two races on an average card. Jagged Potenkim (rated $3.7, backed $4.2) for a small winning day. Only bet into three races on another quiet meeting. Saved on Hey Doc in the main race which kept it from being a blowout. Fine margins… Hellova Street in the last got done by half a head, which would have made it a winning night. Broke even which made for a frustrating week. No real damage done, but after a big week at Caulfield it would have been nice to keep rolling. Banish made the day, backed it at $7.5 after rating $5. Another quiet day. Got Tamasa (rated $5.5, backed $7) to avoid a major loss. Only bet into three races on the night, but went hard on Jolie’s Café (rated $2.4, backed at $3.5) which made it a good winning night. Off to a great start with Levendi (rated $2.8, back $4) and a bit frustrating after that. Backed Alward and Harlem in the Lexus, but saved on Cismontane to chop out. Backed Tom Melbourne in the Mile for a winning day, who of course ran second. Fair bit of action on Cup day and ended up with a small loss. Our Crown Mistress delivered again (rated $2.4, back $2.8). Had plenty of overs on the Cup and saved on the winner, so no damage done on what is an extremely hard race to price. Finally some joy at Flemington. Tribal Wisdom was a big result (rated $12, back $20), as was Hellova Street who made amends for us (rated $3.3, backed $5). We were on Black Sail which got done by half a hair down the outside… would have made it a big day. Again, fine margins. Minor winning day thanks to Fastnet Tempest and Redzel. Of course, Trev does this all year round and you can get involved at any time you want. While membership for Trev’s Bets is now closed, Melbourne Ratings remains open. You can get Trev’s full ratings, tips and staking for the day. It’s the equivalent of going to the races with a long-time pro punter, and being able to follow him into everything. 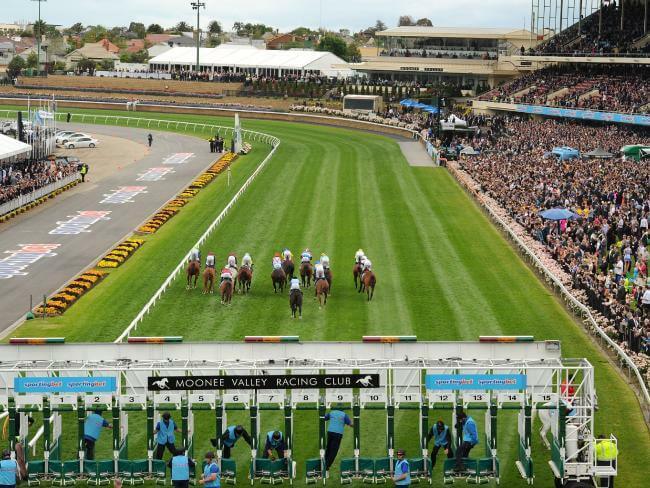 Even if you’re busy and can’t watch the races, the package includes full access to Trev’s Bets – his simplified early betting service which is over $4,200 in profit since it launched last year. Just put your bets on early and forget about them.